How Does Vocabulary Predict Success? 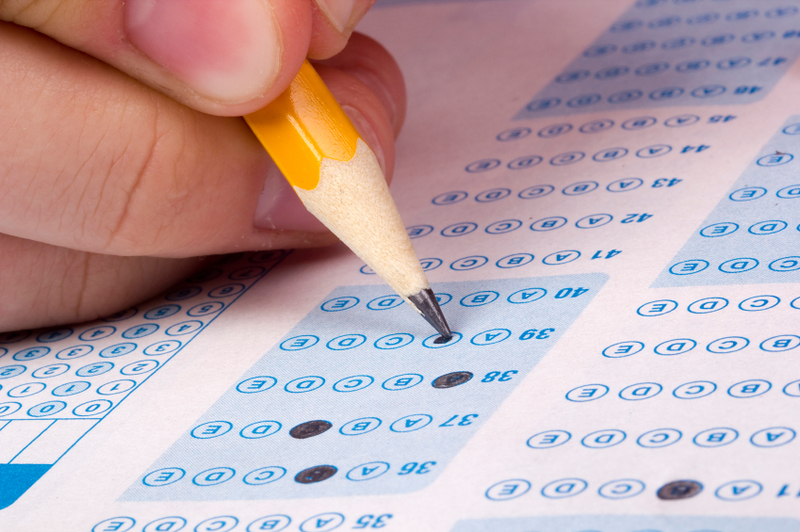 Much ado has been made in the last week or so about the coming changes to the SAT, the entrance exam many colleges and universities in the U.S. use to gauge the potential success of prospective applicants. Besides making the essay component optional in 2016, the College Board, who designs, administers, and scores the exams, has announced its plan to re-vamp the often dreaded vocabulary section, in order to update and modernize its word selections. Reportedly, no longer will examinees’ knowledge and comprehension of archaic words (which have little bearing on current fields of college study, or real-world application) be tested. Instead, the College Board asserts, academic and content-specific words (in line with Common Core Curriculum Standards, and critical to college and real-world success) will start showing up on the exams with the new and improved SAT, beginning in 2016. The announcement of sweeping changes to the stalwart college entrance exam has brought about yet another round of questioning the efficacy of the exams in fulfilling their stated mission of predicting just exactly who is most likely (and, by elimination, who isn’t likely) to succeed in college in the first place. Which begs the question: what’s the point in testing students’ vocabulary anyway? How, exactly, does someone’s vocabulary equate with college and/or real-life success? As anyone who has followed Arthur Chu‘s meteoric (albeit controversial) rise to fame and fortune on Jeopardy in recent weeks can tell you, there’s a lot to be gleaned from erudition. It is clear, for example, that most (if not all) of Mr. Chu’s knowledge comes primarily from reading (widely and on a broad range of topics) as demonstrated by the fact that although he correctly identified so many of the “questions” implied by the answer clues, he mispronounced quite a few of them–an indicatation that while he’s encountered these words frequently on the printed page, he doesn’t use them regularly in conversation. It’s no secret that students with the highest level of reading comprehension skills are the ones who will do the best in college, since college is based primarily on reading. Students who read develop larger and better vocabularies as a natural consequence of their reading, due to their exposure to words in print. Therefore, the more widely a student reads, the broader his/her vocabulary is likely to be. So, if you want a “short cut” to assessing a student’s reading comprehension skill level, the easiest way to determine that is to measure the breadth of his/her vocabulary. However, as anyone who teaches real, live students can attest, sometimes students lack the vocabulary skills necessary to decode what they’re reading, which is why the new Common Core State Standards also stress direct, independent vocabulary instruction. In other words: the two (vocabulary and reading comprehension) are intimately linked–students who read a lot develop better vocabularies, and students who work at developing their vocabularies become better readers. Thus, reading comprenension and vocabulary skills go hand-in-hand. No surprise. That explains why vocabulary has long been used to augur college success, but how does this equate to long-term accomplishment in terms of real-world success? This is where Arthur Chu’s example also comes in handy–it’s not enough merely to read and/or study the words as they occur in print. Putting “theory into practice” is where the rubber really meets the road: students must also apply what they’ve read by working academic and content-specific vocabulary words into their own written texts and/or daily interactions and conversations. The more practiced they are at using their vocabularies to communicate clearly in all situations (reading, writing, speaking, and listening), the more confident they will become. The more confident they become, the better they will perform on any test of their language fluency, whether that test is the SAT, an appearance on Jeopardy, a job interview, or a salable business plan. In life, as in college, success requires half skill and half confidence–as students work on their skills, their confidence will grow. Establish a well-stocked classroom library – first and foremost, a language-rich environment must include a wide selection of reading materials that students will find interesting – which can (and should) include everything from comics to the classics. Use your wall space to set good examples – put up banners, posters, and exemplary student work that feature bits of poetry, famous literary quotes and/or quotes about reading and writing, literary trivia, and stellar sentences (i.e. see “golden lines” below). Extract “golden lines” – take the very best sentences from students’ compositions and highlight them by posting the quoted lines, along with the student authors’ name(s) on posters or large pieces of paper that you’ve put up on the wall. Consider allowing students to nominate their peers’ best sentences for this feature during any peer review done as part of the writing process. You could go so far as to have students review all the entries at the end of a grading period or semester, and vote for the best one(s). You might even award the winner(s) a prize! Post previous students’ best work – as examples, including any especially artistic or witty vocabulary flashcards prior students have created. Stick word magnets on any surface they’ll adhere to – invest in a few Magnetic Poetry kits, or make your own, and stick them on the sides of file cabinets, magnetic white boards, the classroom door (if it’s made of metal) and voila! Watch the magic happen! Have students start a “word collection” of their own – part of cultivating “word awareness” is having students keep track of any “found” bits of language that fascinates them. Therefore, if students are required to keep a “language journal” and hunt for and write down any particularly interesting words, phrases, sentences, or short paragraphs they stumble upon in their reading or daily routines, they will be more aware of how language is used and the particular patterns that attract them. Engage in word-play whenever possible – if you’re having fun with language, then students will. Fun is catchy. Use word games as “sponge” activities – it’s five minutes before the bell, and the lesson you planned is all wrapped up. What now? Give “free time”? NO! Play word games like “Hangman” or “Dictionary”!! Keep ready-made materials or a list of word games always at your disposal – they’ll come in handy in times like these. Hang up a Giant Crossword puzzle – everyone loves to solve puzzles! Giant Crossword puzzles on the wall or door provide a fun group activity. Consider giving out prizes (small trinkets like pencils, etc.) to students who solve a word (or words) correctly. Add word-centric board games to your classroom library collection – games like Scrabble, Boggle, Balderdash, and Apples to Apples stress having fun with words, and are appealing even to teenagers! 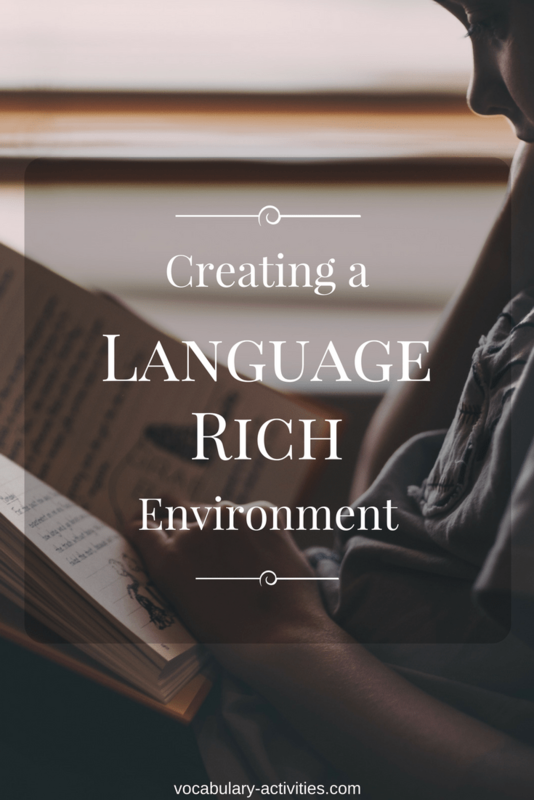 If there are any other ideas that you have, or that you’ve come across in your travels for creating a language-rich, word-centered environment that young adults would enjoy, please leave a reply to this post and share it with us! Listening to Ron Koertge read his delightful poem, “Coloring,” I was reminded of just how much joy even high school students still take from participating in “art projects.” One of the projects my students (even seniors!) always seem to enjoy is creating their own flash cards for reviewing and studying new vocabulary words. Since it’s difficult to give up a lot of precious class time when there’s always so much to teach and only so many minutes to teach it in, what I’ve found works best for me is to dedicate 20 minutes or so at the beginning of each week to explaining the process and allowing students to work on their miniature masterpieces during class at the start of the school year, but to gradually taper off on the amount of in-class time given to this activity as the weeks pass, and encouraging students to keep up the practice on their own (out-of-class) time. Nonetheless, the practice of making vocabulary flash cards also makes a good “sponge” activity – a nice way to wrap up the last 5–10 minutes of class in a productive, fun, and word-centered pastime. Write the vocabulary word and its part of speech (i.e. noun, verb, adj., or adv.) on the front of the flash card, centered in the middle. Also write out the vocabulary word’s part of speech (noun, verb, adjective, or adverb) in the upper right-hand corner on the front of the card. Using a different color highlighter for each part of speech (i.e. all nouns one color, all verbs a second color, etc.) highlight the part of speech in the upper right-hand corner. For example, you could make all nouns yellow, all verbs pink, all adjectives green, and so on. On the back of the card, draw (or cut-and-paste) a picture that expresses the meaning of this word for you. It may be associative, or even abstract; it doesn’t have to be a literal representation. You may also choose to include more than one picture, if you’d like. Underneath the picture(s), write the word, the part of speech, and a definition in your own words (as opposed to copying down the dictionary definition). Complete your vocabulary flash card by thinking up an original sentence that uses the word correctly in context. Write your sentence on the back of the card beneath your definition. I know – brilliant, right? Such was my introduction to the concept of the graphic organizer. I went home, raided my closet, and made one for my own classroom. But the idea of hanging things in front of students to depict how we use language got me thinking. As students move through school and beyond to the workplace and/or post-secondary education and training, it’s important for them to develop an understanding of audience awareness and the appropriate usage of formal vs. informal language. Addressing the boss (or professors) with the same casual language used to greet friends and family members is a faux pas – especially in writing. Ranging from least to most formal, the t-shirt could represent the most casual speaking and writing situations, such as how we greet and engage with our friends and peers. If asked or prompted for examples, students might respond that slang or “text-speak” abbreviations (OMG! u r so funny, LOL!) would fall into this category. A little bit dressier is the polo shirt, which could symbolize a step up in formality. We might, for example, address familiar people who deserve a certain degree of respect (such as parents, teachers, or grandparents) with this type of common, ordinary, everyday language. Though probably devoid of many slang expressions, this category is still a bit “casual Friday,” and may include some regionalisms or colloquial expressions familiar to the group. Even dressier is the shirt and tie. This is “business dress” – serious, buttoned-down Standard Edited English tailored for a specific audience. Examples of this speaking and writing situation would include business or workplace communication and academic writing. This is where the study of vocabulary words pays off. A listing of slang words or expressions might include boost, snitch, jack, lift, rip off, pinch, and/or take the infamous “five-finger discount.” It’s likely that students could generate an even more “colorful” supply of very informal terms. Of course, the common, ordinary, everyday word we’re discussing is steal, and it serves the purpose in most conversations and incident reports. But what if we’re writing an argumentative essay on crime using theft statistics, or an inventory loss report for the boss? This is where vocabulary words come in. Not only can we avoid the monotony of repeating the word “steal” over and over again, but by using a few words with a little more sophistication, we can also dress up our self-expression and give precise and nuanced meanings. We could pilfer, filch, plunder, or appropriate a few choice words, for instance. How about purloin? Not a word you see every day, but something that James Bond or Jason Bourne might be inclined to do in certain desperate situations. In addition to helping students see the subtle differences between formal and informal language, and encouraging them to think about audience awareness, familiarity, and choosing the right words in their own speaking and writing, this graphic organizer might also be used to jump-start a discussion of diction with examples drawn from literature, and/or to discuss the denotation(s) and connotation(s) of a single word or words. Regardless, just as seeing that clothes hanger used as a graphic organizer for “the thesis” in my colleague’s classroom gave me some new ideas and got me thinking, I hope that the presentation of this graphic organizer gives you some ideas to hang around with for a while.